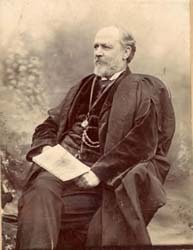 Headmaster and organist in HamptonHenry Ripley was born in London, becoming a pupil teacher in York and then a student at the Battersea Training College. He served in the Navy, later teaching at various schools in Yorkshire. He came to Hampton in 1874 and rented the house then known as 'South View' (now 'Garrick Cottage' and 'Feathers Cottage': nos 2 and 4 Thames Street, Hampton). He was headmaster of the Elementary English School for 28 years until his death. The school occupied part, later all, of the site now occupied by the Parish Hall, Church Street, near his house. He was organist at St. Mary's, Church, Hampton for 21 years and the composer of a large number of published songs including the then well-known 'Empire' series of school songs. He also organised a series of 'high-class' concerts each year and became an Associate of the Trinity College of Music, London.The first history of HamptonHe wrote the first history of Hampton: 'The History and Topography of Hampton-on-Thames' published in 1883/4, as well as various editions of 'Hamptoniana'. The book ran to several editions and the latter publication was originally intended as a quarterly journal but actually appeared very infrequently and only ran to a few numbers, spread over several years. His last work was a syllabus and report book for use in Elementary Schools. Towards the end of his life he suffered family tragedy, including the death of his wife and the drowning of a daughter. This affected him greatly and he became addicted to the solace of laudanum. He resigned as headmaster of the English School in 1902, perhaps due in part to also suffering from his heart as well as his family troubles. In addition, he was worried about whether he would receive a pension after his resignation. These matters preyed upon him to the degree that he took his own life shortly afterwards.